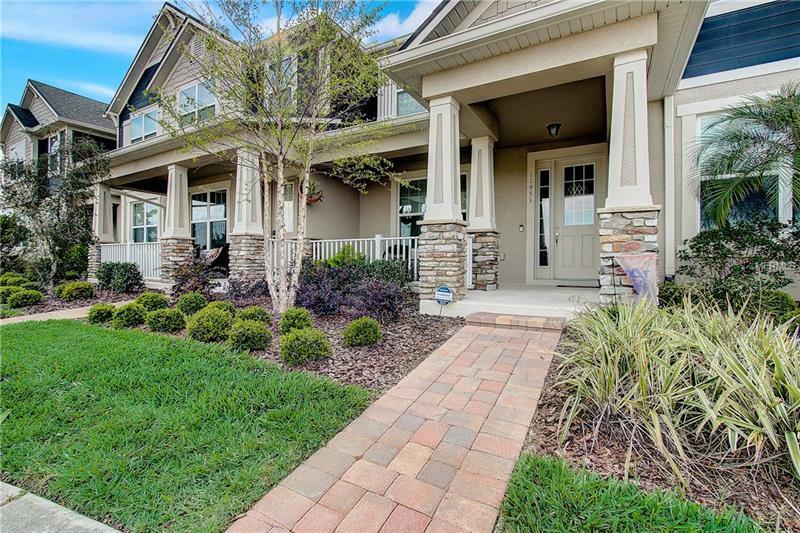 Windermere Trails Townhouse! Luxurious and sunlit, this 3 bedroom, 2.5 bath property shines with a contemporary design that keeps the living areas bright with light wall colors and neutral floor tiles/carpeting. Downstairs, you'll find all the common areas including living room and kitchen/dining room combo with eat-in kitchen island, stone counter tops, custom backsplash, premium cabinetry featuring under cabinet lighting, and kitchen appliance package. Upstairs, the bedrooms are organized in a split-bedroom arrangment with the convenience of an unstairs laundry room for easy access. This overall layout provides boundaries between personal space and areas for gathering/entertaining. A rear courtyard extends the living space to the outdoors offering relaxation under the sun and the stars, and a covered pathway leads to a private 2-car garage. Windermere Trails is a highly desirable community with included amenities: pool, splash park, open air pavilion/cabana, playground, exercise area, wide jogging/walking/bike paths and dog park with wash station. Its unparalleled location offers easy access to tourist attractions and major roadways. Top-rated schools are nearby with Bay Lake Elementary School right across the street. Convenient and low-maintenance living at its finest. Schedule a tour today!